Hucks Pool Company has many services that you may take advantage of. Not only are we a construction company, building pools, spas, wet decks etc., but we also have service technicians on call and a full service chemical and parts division. You can come here for anything. If we do not have the part you need in stock, we will order it for you and, if need be, install it. We also deliver chemicals. Hucks Pool Company continues a tradition of building high quality pools & spas in North and South Carolina. It is our goal to provide clients with excellent design, execution and service from beginning to end. We will help you through every step in achieving your dream of adding a pool to your home or resort, from choosing a style to providing tips on how to best maintain your investment. In business since 1963 we know a pool isn’t just another structural addition to your Property; it’s a lifestyle enhancement. Catch the dazzle of light glimmering off the water, hear the soothing sound of a waterfall, or enjoy the excitement of children splashing and you’ll know that there is more to a Hucks pool than just architecture and construction. 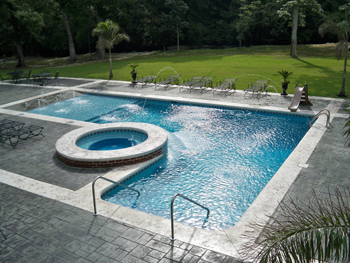 We design & build our pools to specifically reflect your requirements and desires. That gives our pools a distinct personality. Hucks Pool Company has an unlimited General Contractor’s license that allows us to handle the smallest residential pools to the largest commercial projects. No cookie-cutter pools here –We are proud of our in-house design team who can help create the pool of your dreams. Each Hucks Pool is a one of a Kind Design.